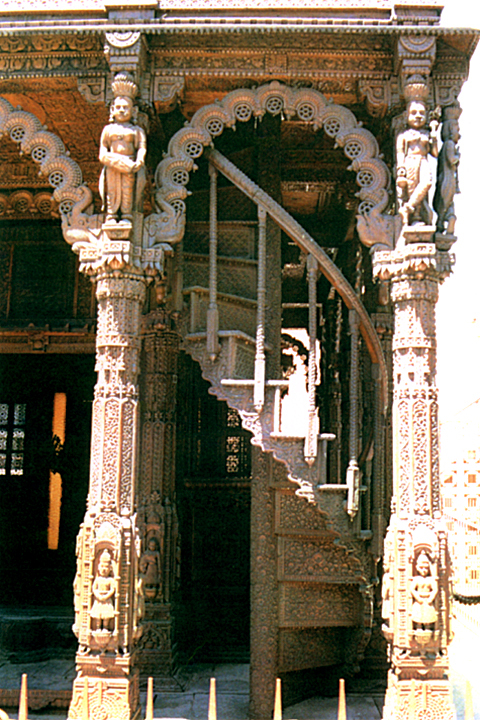 When the Summa Corporation decided to demolish its famous Las Vegas strip hotel, “The Castaways,” in 1988 to make way for the new Mirage Hotel, among the furbishings of the Castaways put up for sale was a fourteen-ton teakwood replica of a Jain temple. Unable to find a buyer willing to pay the asking price of $500,000, the corporation eventually donated the piece to The Friends of India, a Las Vegas sub-chapter of the Jain Center of Southern California. The replica had originally been built by sixty-five Jain artisans over a two-year period at the turn of the twentieth century. The project, however, was not a Jain initiative; the British government had commissioned the replica’s construction so that it could be displayed in their East India building at the St. Louis Fair of 1904-05. When the fair ended, the temple was dismantled, recrated and marked for shipment to England but, for some unknown reason, was never sent. The American art collector who eventually purchased the piece never reassembled it, keeping it in storage until his death in the early 1970s. When his collection was auctioned, the temple passed into the hands of an art dealer, who then sold it to Howard Hughes’ Summa Corporation. For fourteen years the replica would serve as decorative art in the gardens of the Castaways Hotel. The management dubbed the temple “The Gateway to Luck” and constructed beside it a small wishing well in which gamblers and other guests could toss coins for luck. Certainly very few patrons of the Castaways could have realized the great irony of seeking luck in gambling from a Jain temple! Except for the fact that it is made of teakwood rather than white marble, the replica is an exact copy of the temple of Palitana, one of the most ancient and revered Jain tirthas in Gujarat. The model stands thirty-five feet high at its central tower, and is twenty square feet at the base. 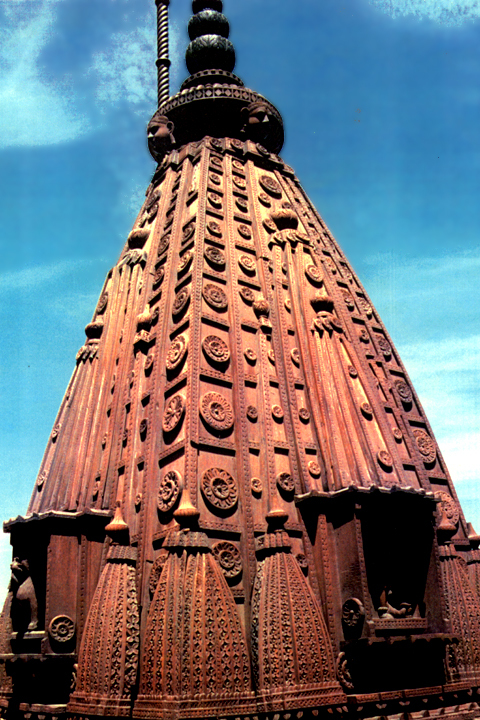 It has twelve intricately carved pillars, a set of carved spiral stairs leading up to the upper level, and an elaborate parapet wall on the upper level, with a statue above each pillar. The temple dome rises in the middle, with two other carved canopies on the upper level. After taking possession of the temple replica in 1988, the Jain Center of Southern California has kept it in storage until the replica’s various cracks and missing pieces can be renovated by Indian artisans, and a special hall can be constructed at its new home, the Jain Bhuvan in Buena Park, California. Until then, three large panels from the replica are on display in the center.